BLACKPINK Jennies Sharing Her Favorite Food Recipe - On BLACKPINK House, Jennie shows her ability on cooking. She looks so gorgeous when she was in the kitchen while making macarone for geourila fan meeting in Hongdae. 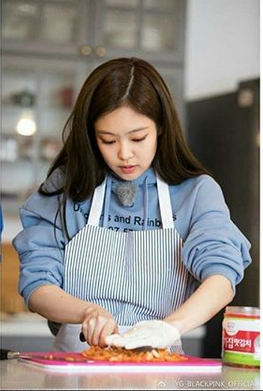 In the recent V Live, Jennie also shared her passion in cooking. Jennie shares her favorite food recipe to BLINKS on V live. She said that avocado rice and egg codfish are her recent favorite foods. Jennie said that her hobby is trying recipe recently. The recipe for her favorite food are adding chooped onion to the rice then add the sesame oil as you wish. Separate egg yolks with the white, add the egg yolk to the rice and egg codfish then mixing it. And for the final touch, Jennie always adding avocado. Do you wanna try it BLINKS?